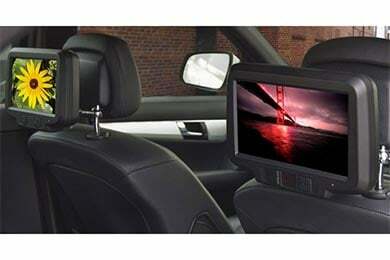 Introduce your passengers to a world of unlimited fun and games with Vizualogic Elite Headrest Monitors. Packed with dazzling 9" high-definition monitors, the Vizualogic headrest entertainment system is the key to a calm, quiet and well-entertained crew. Available in a charcoal grey finish that compliments any cabin, Vizualogic headrest monitors are the perfect synthesis of style and technology. Each Vizualogic Elite Headrest Monitor boasts its own DVD player to go along with an array of high-tech plugins designed to function with the latest high-tech gadgets. This suite of advanced inputs includes dual A/V jacks, SD card reader, USB port and a wireless FM modulator. And, each monitor operates completely independently so your daughter can stream her favorite show to one while your son gets his game on in the next seat. Universally designed to mount to most headrest posts, you get backseat fun no matter what you drive. And, the included mounting hardware makes installation a snap. Plus, each monitor comes equipped with a set of wireless IR headphones for a hassle-free journey. Meanwhile, the backlit LED monitors make for easy operation at night. 90-day warranty. Reference # 767-605-587 © 2000-2019 AutoAnything, Inc.